Brand Information: This is a Commander Slub Twill jacket made by GAP. Dean first wears it in Bad Day At Black Rock (3x03), for the entire episode – only taking it off briefly in the very last scene, when he hangs it over a gravestone, thus leaving Bella with the perfect opportunity to steal his scratch-and-win tickets. In Red Sky At Morning (3x06), Dean wears it anytime they are outside when they are not wearing suits or tuxes, except for the very last scene of them driving. 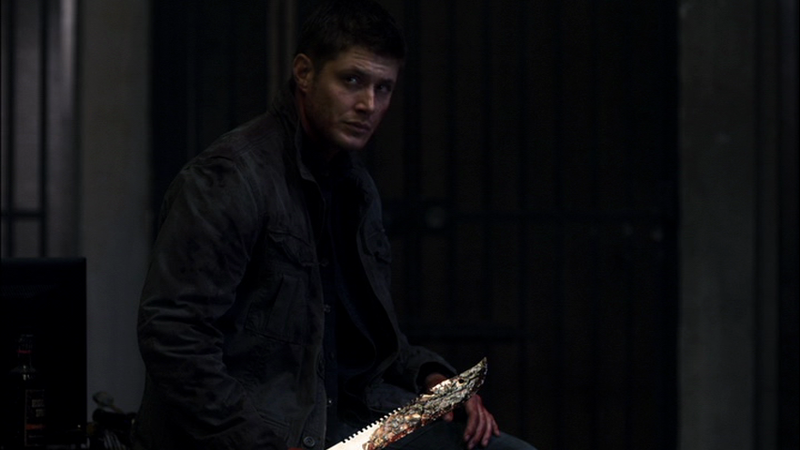 In Malleus Maleficarum (3x09), Dean wears it once he takes off his suit. He takes it off when they get back to the motel and he starts coughing up blood, and then puts it on again when he recovers and goes to help Sam with the witches. He is changes to a different jacket for the final scene of the episode. 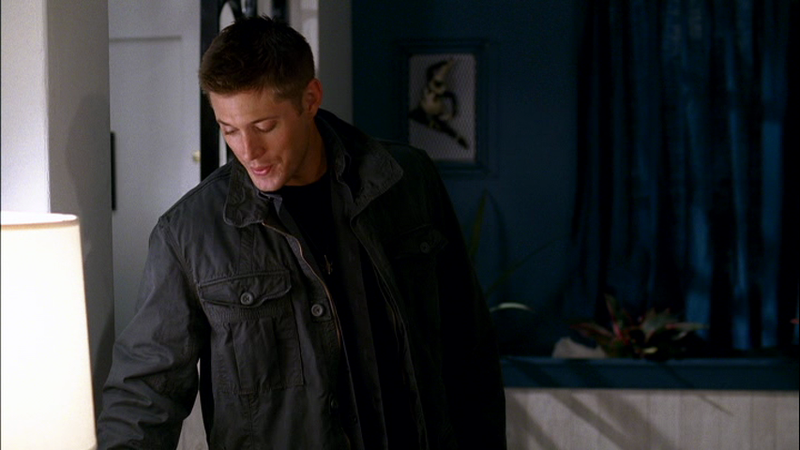 In Mystery Spot (3x11), Dean wears this coat when they leave the motel room every Tuesday and also on both Wednesdays. In Time Is On My Side (3x15), Dean wears it at the beginning when they interrogate the demon. He takes it off sometime between the interrogation and returning from buying the body. In Metamorphosis (4x04), Dean wears it once they are on the road to Carthage. He takes it off when they meet Travis at the motel and they get ready to hunt the Rugaru, and then puts it back on again once they leave the motel room. In I Know What You Did Last Summer (4x09), Dean wears it until he and Sam jump out the rose window of the church. In On The Head of A Pin (4x16), Dean wears it from the beginning of the episode until he takes it off just before he starts to torture Alistair. In The Rapture (4x20), Dean wears it for the whole episode except when he is inside the motel room, he uses it as a cover when he is sleeping in the motel room though. In When The Levee Breaks (4x21), Dean is still wearing it at the beginning of the episode. He takes it off when he and Bobby are talking, but puts it on again when he goes outside to talk to Castiel. He leaves it on for the rest of the episode. In Free To Be You and Me (5x03), Dean wears the coat at the beginning of the episode when he kills the vampire. It gets bloodstained, so we see him cleaning it when Cas drops by. He next see him wear it when he takes Cas out to get laid – he keeps it on for the rest of the episode. In The Curious Case of Dean Winchester (5x07), Dean wears it for the whole episode whenever he is not wearing a suit. Old Dean takes it off when he is digging the grave with Bobby. In Point of No Return (5x18), Dean wears this jacket to Van Nuys with Sam and Cas to try to rescue Adam. In Two Minutes to Midnight (5x21), Dean wears this jacket from the beginning of the episode until after his meeting with Death. In Swan Song (5x22), Dean wears it when he shows up at Lisa’s near the end of the episode. 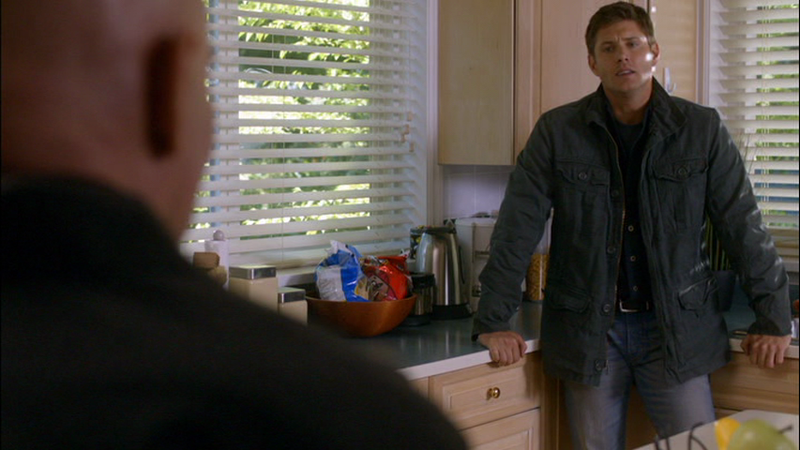 In Exile on Main St. (6x01), Dean wears this coat when he takes Lisa and Ben to Bobby’s. He keeps it on for the rest of the episode. In The Third Man (6x03), Dean wears this coat for the entire episode, he only takes it off when he is wearing a suit to meet Sam at the morgue and talk to the cop, and when he and Sam are discussing the case in the hotel room before Cas takes them to the Birch’s house. In Live Free or Twi-Hard (6x05), Dean wears this coat from the beginning of the episode until he kills all the vampires. He takes it off when he gets back to the motel after having seen Lisa. He then puts it back on before he leaves to find the vampire’s nest. It gets heavily blood stained in the resulting vampire massacre and Dean does not wear after that. In Clap Hands If You Believe (6x09), Dean has successfully gotten the blood stains out of this coat, and he wears it the morning after his abduction, until Sam takes care of the fairy problem, only taking it off when he is in the motel room. In Like A Virgin (6x11), Dean wears this coat every time he is outside (or at Dr. Visyak’s house) from the beginning of the episode until they rescue the virgins. In Mannequin 3: The Reckoning (6x14), Dean wears this coat when he is on his way to go see Lisa and Ben. He takes it off while inside Lisa’s house, but then wears it for the trip back to Sam and the dispatching of the ghost. In My Heart Will Go On (6x17), Dean wears this coat for the entire episode, except when he is in a suit, and when he is inside the motel room. In Frontierland (6x18), Dean wears this coat when they uncover the Campbell library. He takes it off when they start looking through the books for information about phoenixes. In Let It Bleed (6x21), Dean wears this coat when he and Sam summon Balthazar to tell him about Castiel’s plan and ask for his help. He keeps it on for the rest of the episode, except when he is sitting besides Lisa’s hospital bed with Ben. In Hello, Cruel World (7x02), Dean is wearing this coat when he comes into Bobby’s kitchen and Bobby and Sam tell him the new about the swim-team deaths, insisting that he go look into it. Dean changes into a suit to investigate, but then changes back into this coat before returning to Bobby’s. The paramedics then remove it before loading him into the ambulance. In The Girl Next Door (7x03), Dean puts this on to escape the hospital, since they were the clothes he was brought in with. In Shut-Up, Dr. Phil (7x05), Dean wears this coat from when Sam arrives with the chicken feet, until the end of the episode. In Slash Fiction (7x06), the leviathan impersonating Dean wears this jacket. In How To Win Friends and Influence Monsters (7x09), Dean wears this coat when he, Sam, and Bobby hunt the monster in the woods. He takes it off only when he is eating at Biggerson’s later, otherwise he wears it for the rest of the episode. In Death’s Door (7x10), Dean wears it for the entire episode. In Plucky Pennywhistle’s Magical Menagerie (7x14), Dean wears this coat for the entire episode whenever he is not in a suit or researching at the motel. In The Born-Again Identity (7x17), Dean wears this coat for the entire episode, except when he is inside Rufus’ cabin calling Bobby’s contacts for help. In Reading is Fundamental (7x21), Dean wears this coat for the entire episode. In A Little Slice of Kevin (8x07), Dean starts the episode wearing this coat as he drives to Rufus’ cabin. He takes it off once he gets there. He wears it again later in the episode when he returns to the motel room with some beer after Cas arrives. He keeps it on for the rest of the episode. Dean wears this coat in Torn and Frayed (8x10), when he arrives in Kermit, TX, and has a fight with Sam. He wears it again when he and Cas start scouting out possible Crowley-hideouts on their search for Samandriel. He keeps it on until Cas leaves for heaven. In Everybody Hates Hitler (8x13), Dean wears this coat at the beginning of the episode when he and Sam first enter the Men of Letters Bunker, and again when Dean returns “two weeks later” after going for a run to see Kevin and Garth. He also is seen wearing it at Aaron’s house after Aaron and the golem leave, and he and Sam talk about what to do about the golem – he takes off the coat during the scene tough, before the Nazi Necromancers attack. He is then seen wearing it again when he, Sam, and Aaron return from disposing of the necromancers bodies. In Goodbye Stranger (8x17), this is the coat that is worn by the fake Dean in Naomi’s simulation tests for Castiel. In Pac-Man Fever (8x20), Dean is wearing this coat at the beginning of the episode when he comes back to the bunker with beer. He immediately takes it off though. He wears it whenever he is outside for the rest of the episode, except, obviously, when wearing a suit at the morgue. He only wears it when inside the bunker when he returns to the bunker to have Sam tell him that he figured out where the Djinn is possibly hiding and at the end when he comes in and hugs Sam before taking off his coat. In Sacrifice (8x23), Dean wears this coat from when they get the demon tablet from Kevin until the end of the episode. Dean is still wearing the coat in I Think I’m Gonna Like It Here (9x01). He wears it for the entire episode. He is still wearing the coat at the beginning of Devil May Care (9x02), but takes it off sometime after telling Sam that Crowley is in the trunk and before he and Sam arrive with Crowley at the Bunker. In Rock and a Hard Place (9x08), Dean wears this coat when he and Sam go to investigate the church that all the victims had in common. He takes it off for the meeting with the chastity group, and when he gets to Suzie’s apartment. He puts it back on as he leaves Suzie’s apartment and gets captured by Vesta, and wears it until Vesta is killed. In Meta Fiction (9x18), Dean wears this coat from when he and Sam track down Gadreel until the end of the episode. But yes, it IS a nice jacket.